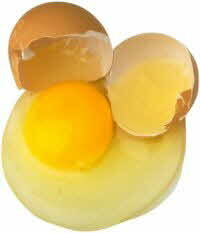 Albumen, or egg white, makes up about 65% of an egg’s weight and more than half of an egg’s protein. As an egg ages, the protein in the egg white changes and becomes thinner and more transparent. Fresh eggs sit tall and firm in the pan, and older eggs will spread out more. Beating albumen (egg whites) into a foam increases its volume by up to 6 to 8 times. When you are going to beat egg whites, let the eggs sit at room temperature for 30 minutes before using them. The egg whites will beat to a greater volume.